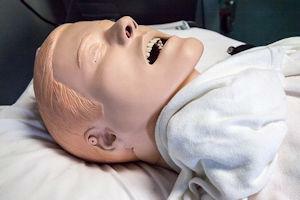 The classes used the well-known Resusci manikin victim to practice. Typical of most models, this Resusci manikin was only a torso, to allow for storage in a carrying case. As instructed, one of my classmates gently shook the doll and asked, "Are you all right?" He then put his ear over the manikin's mouth to listen for breathing. "He said he can't feel his legs!"